Howdie ... I'm on a card making roll but today I am sharing another card from last year as I need to take photos and edit the rest of the cards when i get back off vacation. I made this card for my friend Mel for her big birthday last year. 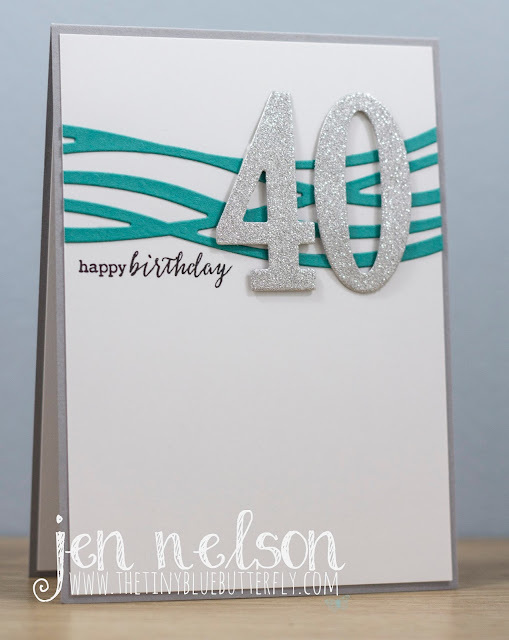 I cut out the Stampin Up Large numbers framelits from glitter card stock and the swirly scribbles thin-let from Bermuda bay card stock. I added the sentiment from CBS to a piece of white card stock and then added the die cuts onto the base. The panel is then mounted on smoky slate card stock to finish it off.